So I know this is a bit 'cart before the horse' as I've just done 2 posts with my pick of the sales but I've had so many people ask me via DM about my tips for shopping well in the sales so I thought this would be a good FAQ one to have on the blog - it applies year round so I'll have it here to refer people to going forward too. The sales are when I do the bulk of my shopping. I hate paying full price and I don't have the budget to anyway so I always hold back on buying everything I need. Don't get me wrong, I do buy the rest of the year but usually when there's a 20% off...or even a 10%. There's always a discount to be found! I've covered these off at various times on the blog - there's a summer 'what to buy in the sales' blog post on this link and I did a few Must Have Essentials posts before Christmas that are worth checking back on as they have links to current items and they're likely to be in the sale! There's a Footwear one on this link, a coat post on this link and a jersey basics one on this link. We all follow people whose style we emulate...people who look so well put together always. For me, it's never a celebrity, I instead admire other bloggers, other normal women with realistic budgets, who shop well. When I look at their instagram accounts or blogs, I think about what items I'm seeing often and what items stand out and make me click on that that heart. There's so often an 'aesthetic' - a colour scheme/tonal effect. This is usually achieved by having a beautifully curated wardrobe. Let me give you an example - Margapau...I've screenshotted her profile page in this image. 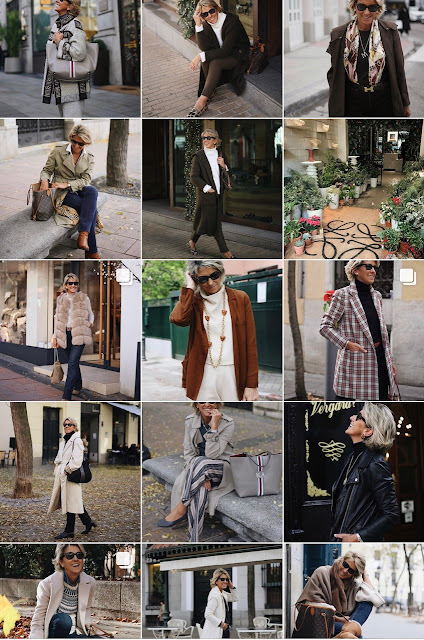 She's effortlessly stylish but there's a theme - beiges, browns, tan, camel...pops of check, leopard and red. A bit of fur and some statement jewellery. So I pick out the images from her profile that really appeal to me and think about how I can emulate them with what I have. There are some items that repeat over and over - a trench coat, a camel long line cardigan, a checked blazer. All classics and you've got tons of inspiration from someone like this to wear these items frequently. 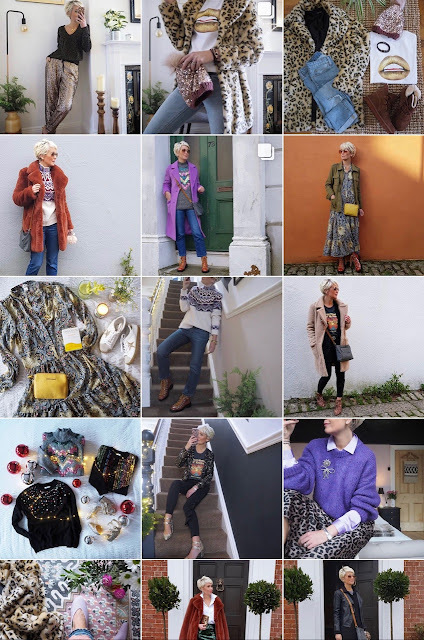 Natalie is another great example - she's got such a gorgeous feed but again, there are themes throughout, a bright coat, a beautiful midi dress. As well as inspiring me to wear what I have in different ways, she also inspires me to find specific items to add to my wardrobe. For instance, she wore her purple M&S coat a few different ways that I'd not considered and it got me trying mine the same way. So when I think about what I might get in the sale, I look back on my saved images from both these ladies...and others on Instagram. All the things that have inspired me....which brings me nicely to point 3.. If you have a list of gaps in your wardrobe, you will find it easier to prioritise what you buy. I usually try on everything I like when I'm in the sales. Then I whittle it all down to the items that fit well and I'm starting to fall in love with. Then I look at my list. I do go off piste if I still really want something but it's a great way to discipline yourself. Again, I wrote a blog post about these last year and you can read it on this link. Thinking here of the less frequently worn items that are lovely to have in your wardrobe but that you should never pay full price for. For example, sequin dresses, faux fur, coloured leather. It's lovely to snap something from this category at 70% in the sale - hold out until the end of the sales though and always go in-store. The best bargains are never online. This is a no brainer...you should be able to think of 3 or 4 NEW outfits you can incorporate each new piece into (that is apart from the non essentials in point 4). Plan these outfits before you take the tags off and if you can't find 3, return the item because you won't wear it enough. The word NEW is especially important if you (like me) have a habit of buying multiple similar items...you must be brutal and honest with yourself when you get home. If you're only making up 3 or 4 outfits that you were able to make up already with the existing item, then don't keep the sale item. Last tip, keep all your receipts and be disciplined about bringing stuff back. 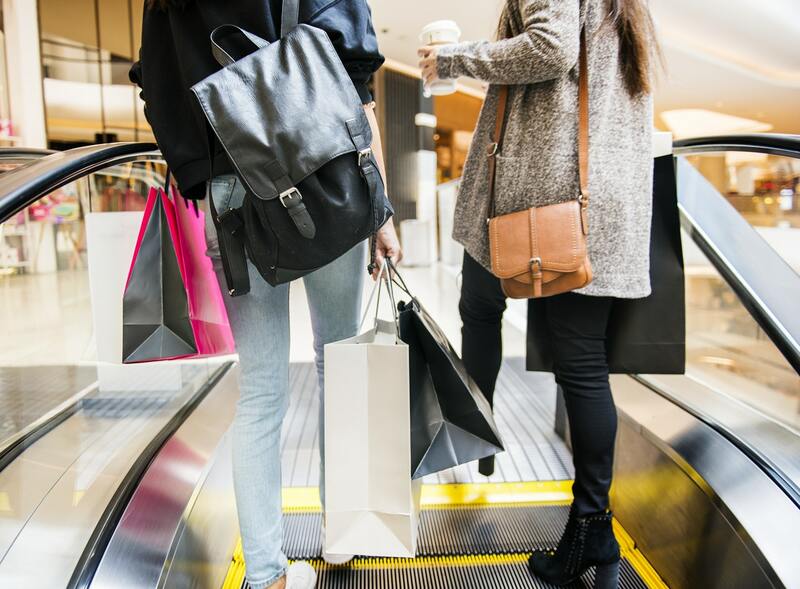 All shops nowadays give refunds or credit for sale items and will happily take back items within the timeframe specified at purchase. No excuses! Ok with all that knowledge at your disposal....I can go prep Part 3, the final part of my sales picks. I'll be back soon! My number one rule is, do I have enough money in my bank account to treat myself and the answer is invariably no for the last 20 plus years. End of.